I don’t know how this book managed to fly under my radar. I was browsing through Netgalley looking for an interesting m/m and this one caught my eye. After requesting it I googled it and it turns out that it was a very popular book and it had great reviews. Needless to say the reviews were spot on, after reading it I can honestly tell you that this is one of the best romances I have read all year. When Simon Murray’s best friends dragged him to a party he had no idea that his life would change forever. As a huge Australian Rules football fan he finds himself defending (and kind of insulting at the same time) the game's biggest star from a group of people who were talking crap about him. The surprise comes when he realizes that said football star was also at the party and heard everything. Declan Tyler has been suffering from a serious case of bad luck in the game. Plagued by injuries he has to deal with the criticism and blame from the fans that once adored him, so when he hears Simon defending him but also treating him like a regular guy he feels fascinated by him. They develop a relationship but there are huge obstacles in their way, the main one being that Declan is closeted. The book is about two people falling in love and learning to deal with everything life throws at them, but it’s also a tale of friendship, growing up, and the sacrifices that come with that. Simon was a wonderful character. He was likeable but seriously flawed. I think he was afraid to leave his comfort zone and start living. He felt lonely but couldn’t risk taking a chance to maybe change it. He was insecure and sometimes self-centered. Basically, he was human like the rest of us. If you are expecting a perfect romance hero you won’t get it here. Declan was closer to the type of heroes I’m used to finding in romance novels, but there were some brilliant moments in the book that showed us that he wasn’t as perfect or as secure as he may seem. They made an incredible couple balancing each other’s imperfections, they were opposites but their attraction was believable. Simon’s friends were also incredible characters, especially Roger. Just as Simon and Declan, he was layered and flawed. He was also very funny. It might seem like this was a very serious book but it’s actually closer to a rom-com, the dialog is laugh-out-loud funny and Simon is a hilarious narrator, albeit somewhat exasperating at times. There were a lot of reasons why I liked this book. The love story was beautiful and romantic, the characters were likeable and relatable, but most importantly it was about friendship. Sean did a wonderful job at portraying some of the strains and issues that arise when your best friend finds love, and how sometimes it’s difficult to deal with not being the most important person in your friend’s life anymore and how sometimes you might even use your love and concern for your friend to even subconsciously sabotage their relationship. This book shows us a bit of the dark side of friendship (which is uncommon on a romance novel) but also shows us that friendship is something invaluable and that a true friend will always have your back. I have read tons of books that have some m/m element to them but that are so preachy about it that it becomes annoying. If I’m reading an m/m romance I don’t need convincing, there are other ways of driving a point home and Kennedy does it perfectly because instead of telling you he shows you. The problems that Simon and Declan face are not fabricated so that the author can send a message, they are real problems and that is what makes it more poignant. The only reason I don’t give this one a 5 is because the story does drag a lot during the third quarter, and just when you think the book might be about to end then another thing happens. But the end was satisfactory and even original in the way the characters reacted and actually ended up talking about things and compromising and accepting that things won’t always be perfect, it may seem anticlimactic when you read it but I think it was a very appropriate ending. In the end this was a story about real people. If you are a fan of contemporary romance I think you are going to love it. If you like hot sport-player heroes you should read this one because Declan was dreamy, or if you are in the mood to read a book about relationships where the romance develops quickly but where you also see the long road to the happily ever after, then this book is the one for you. Football, friends, and film are the most important parts of Simon Murray's life, likely in that order. Despite being lonely, Simon is cautious about looking for more, and his best friends despair of him ever finding that special someone to share his life. 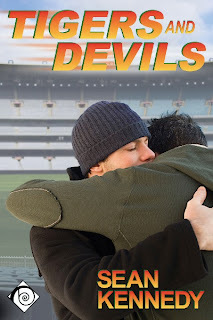 Against his will, they drag him to a party, where Simon barges into a football conversation and ends up defending the honour of star forward Declan Tyler -- unaware that the athlete is present and listening. Like his entire family, Simon revels in living in Melbourne, Victoria, the home of Australian Rules football and mecca for serious fans. There, players are deemed gods and treated as such - until they do something to cause them to fall out of public favour. Declan is suffering a horrendous year of injuries, and the public is taking him to task for it, so Simon's support is a bright spot in his struggles. In that first awkward meeting, neither man has any idea they will change each other's lives forever. As Simon and Declan fumble toward building a relationship together, there is yet another obstacle in their way: keeping Declan's homosexuality a secret amidst the intrusion of well-meaning friends and an increasingly suspicious media. They realise that nothing remains hidden forever... and they know the situation will only become more complicated when Declan's private life is revealed. Declan will be forced to make some tough choices that may result in losing either the career he loves or the man he wants. And Simon has never been known to make things easy - for himself or for others.